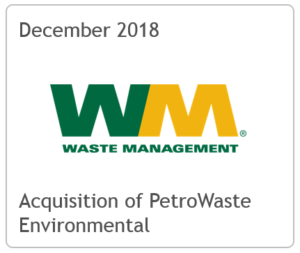 TPH Advises Waste Management on the Acquisition of Petro Waste Environmental – Tudor, Pickering, Holt & Co.
Tudor, Pickering, Holt & Co. served as exclusive financial advisor to Waste Management (NYSE: WM) on its subsidiary WM Energy Services Holdings, LLC’s acquisition of Petro Waste Environmental. Petro Waste Environmental is a leading provider of comprehensive oilfield environmental services and solid waste disposal serving the Permian Basin and Eagle Ford Shale Play, the most economically active oil and gas producing regions in the U.S. With its oilfield solid waste disposal solutions, waste-handling capabilities and conveniently located disposal sites catering to the oil and gas industry, the addition of Petro Waste Environmental to Waste Management Energy Services’ portfolio greatly enhances the company’s offerings. Waste Management Energy Services now has a strong presence in the Permian Basin with multiple disposal sites in West Texas and an expanding footprint in the Eagle Ford Shale Play with one disposal facility currently under construction and a second permitted in south Texas. For Waste Management’s press release on the transaction please click the link below.